Tonight the Space Station flew out of the west and overhead as it faded into the shadow of the Earth. 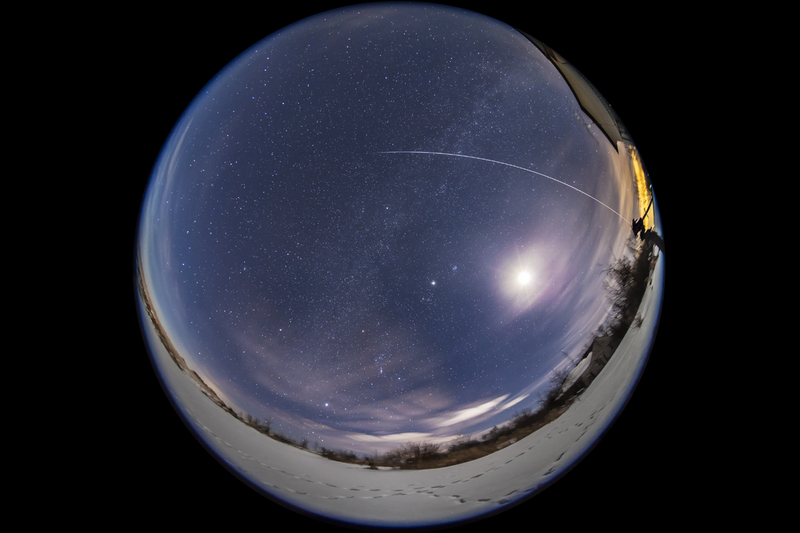 Because tonight the ISS was coming up high into the north, almost directly overhead, I used a fish-eye lens to shoot the entire sky, and took three exposures, each 90 seconds with the camera tracking the stars. The bright Moon is at right, but despite its light the Milky Way still shows up. The Space Station faded into sunset just as it crossed the Milky Way. Canadian astronaut Chris Hadfield is on board, about to take command at the next crew change. He’s been tweeting lots of comments and photos from space. Check him out at @Cmdr_Hadfield. The Starfish and the Flaming Star combine to create a rich star field in the Charioteer. I shot this last week, using a favourite small refractor that takes in a generous field of view for a telescope. In this case, it frames the star cluster at left called the Starfish Cluster, or better known as Messier 38. At right the large number 7-shaped patch of nebulosity is the Flaming Star Nebula, known by its catalog number as IC 405. 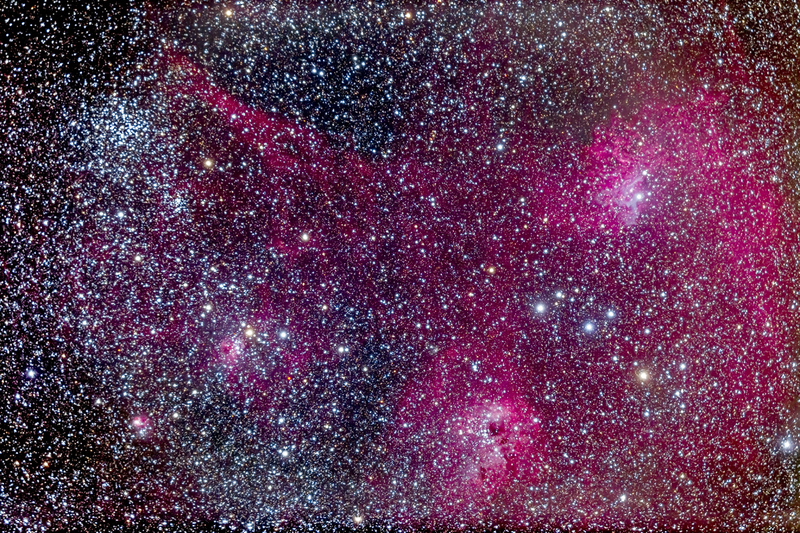 At bottom, the nameless companion nebulas are IC 417 at left and IC 410 at bottom centre. Of note is the colourful grouping of six stars at right called the Little Fish. It’s not a proper star cluster but an asterism, a chance alignment of stars that happens to look like something imaginative. David Ratledge presents a nice list and photo gallery of similar whimsical asterisms at his Deep-Sky.co.uk website. The entire field is a rich hunting ground for the eyepiece or camera. You can find it these nights, in winter from the northern hemisphere, straight overhead in the evening, in the middle of Auriga the Charioteer. For this portrait I shot and stacked eight 7-minute exposures at ISO 800 using a filter-modified Canon 6D on my TMB 92mm apo refractor at f/4.8. 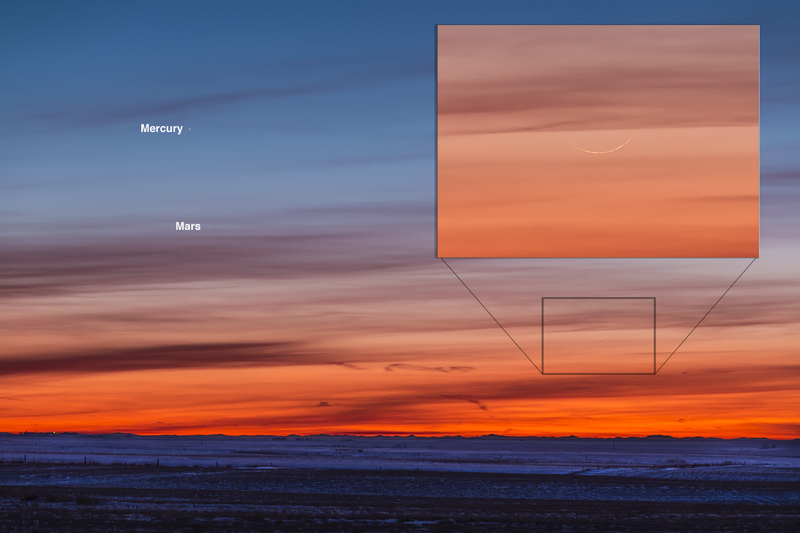 This was the sky scene Sunday night, February 10, as an ultra-thin Moon entered the evening sky, providing me with a “personal best” for sighting a young Moon. I’ve had to highlight and annotate the subjects here but all the players were obvious in binoculars. Only Mercury, usually the most elusive planet, was obvious to the naked eye. Below it shone dimmer Mars, here embedded in some cloud. But the real catch of the night was the 18-hour-old crescent Moon, shimmering low in the red twilight. It appears as a razor-thin crescent, magnified in the inset. Sighting any Moon younger than 24 hours old is considered a find, the all-time record being a Moon about 14 hours old. I’m happy with an 18-hour catch! On Sunday night conditions were nearly ideal, despite the clouds, with the Moon angled about as far from the Sun as it could be from my northern latitude, positioned directly above the sunset point. You can tell that because the crescent, which must be oriented toward the Sun, appears nearly horizontal. This is the New Moon that also signals the start of the Chinese New Year, the Year of the Snake. So 迎春接福 ! Here’s looking back at you Commander Hadfield! Here is our Canadian astronaut sailing into the Milky Way. Since he launched to the International Space Station in December Canadian astronaut Chris Hadfield has been tweeting many photos of places in Canada that he sees passing by his window 400 kilometres below. With the Space Station now entering our evening sky in western Canada, I can return the favour and photograph his home in space traveling among the stars. This night he flew through Orion and into the winter Milky Way. This was the scene Sunday night, February 10, in a pass of the Space Station low across the south starting at 7:14 p.m. MST. The exposure was four minutes, long enough to just capture the entire pass from west to east, right to left in this image. At left, the trail of the Space Station fades out as the ISS entered Earth’s shadow and into night. The image also captures the Milky Way at left and the Zodiacal Light rising from the last vestiges of blue twilight at right. Jupiter is the brightest object above centre. For the next two weeks we’ll be enjoying nightly passes of the ISS with our Canadian astronaut on board. See, That’s the Orion Nebula! What a hardy bunch we are in Canada, braving winter weather to see Orion and company. A well-bundled group of sky fans partakes in an impromptu tour of Orion and his famous nebula. 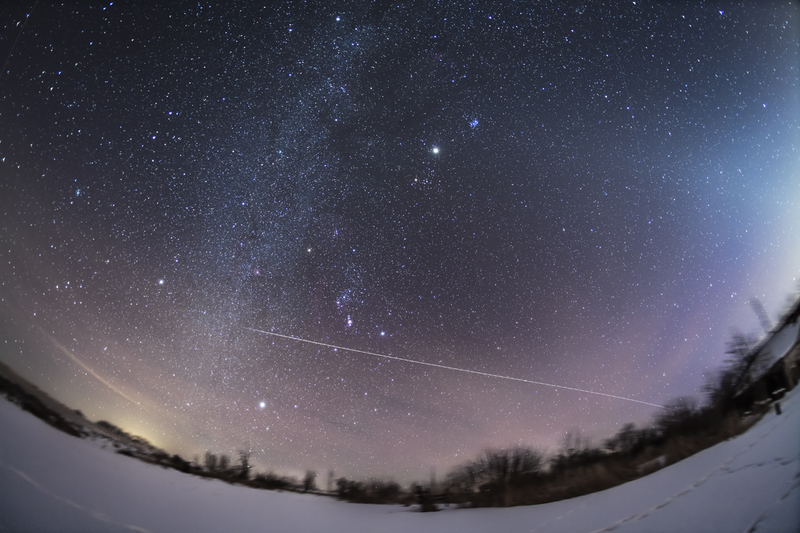 I shot this scene last night, February 9, at the first of a series of monthly stargazing nights at the local university research observatory, the Rothney Astrophysical Observatory. About 120 people and volunteers gathered to take in the sights of the winter sky, as best they could as transient clouds permitted. Inside, speakers presented talks themed to the Chinese New Year, which is governed by the timing of the New Moon each year. As this was a New Moon night, people were able to stargaze under reasonably dark skies to see deep-sky sights such as the Orion Nebula. Want to know where it is? 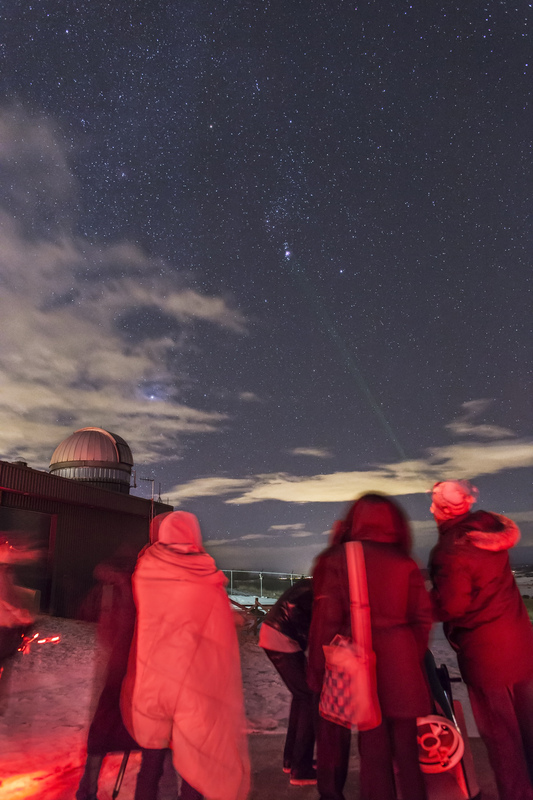 An astronomy club member points it out rather handily with one of the best tools astronomers have for public outreach, a bright green laser pointer. Controversial and dangerous in the wrong hands, when used responsibly these laser pointers are wonderful for conducting sky tours. As a side note, this is a 3-second exposure with a new Canon 6D camera at ISO 8000, yet the photo shows very little noise. In just 3 seconds, the Milky Way is beginning to show up! I could have gone to previously unthinkable speeds of ISO 12000+ and still had a presentable shot. This will be a superb camera for nightscapes and available light shots. Out of the skyglow from lights and the remains of twilight rises a tapering pyramid of light. 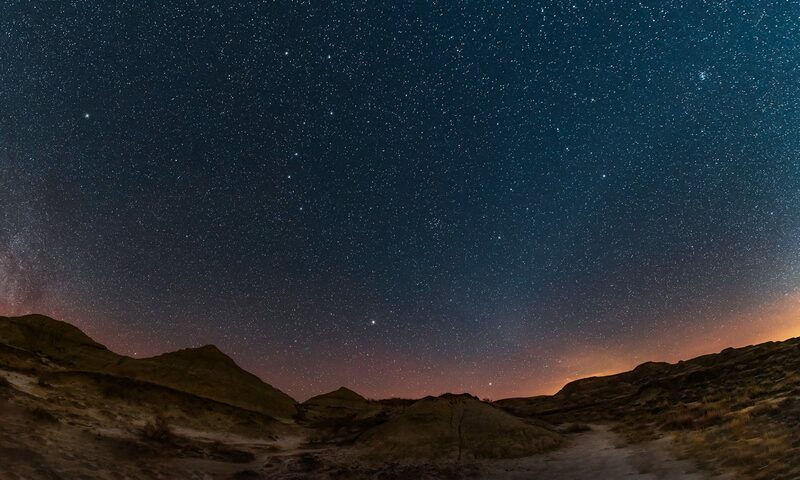 It’s one of the night sky’s most subtle sights for the naked eye. This is the Zodiacal Light, and I’ve been trying to capture it in the evening sky from home for a number of years. Last night was a good night for it. The sky was very transparent, for the first couple of hours at least. An ultra-wide angle lens allowed me to capture the Light in context with the wider sky, towering out of the southwest at right, reaching up to the Pleiades and Jupiter high in the centre of the frame. The Milky Way is at left. Everyone knows the Milky Way but the Zodiacal Light is less famous. It’s visible only in the hour or two after sunset or before sunrise. Late winter and spring are the best times to see it in the evening sky. That’s when the ecliptic – the plane of the solar system where the planets lie – is tipped up at its highest angle above the horizon putting it above obscuring haze. 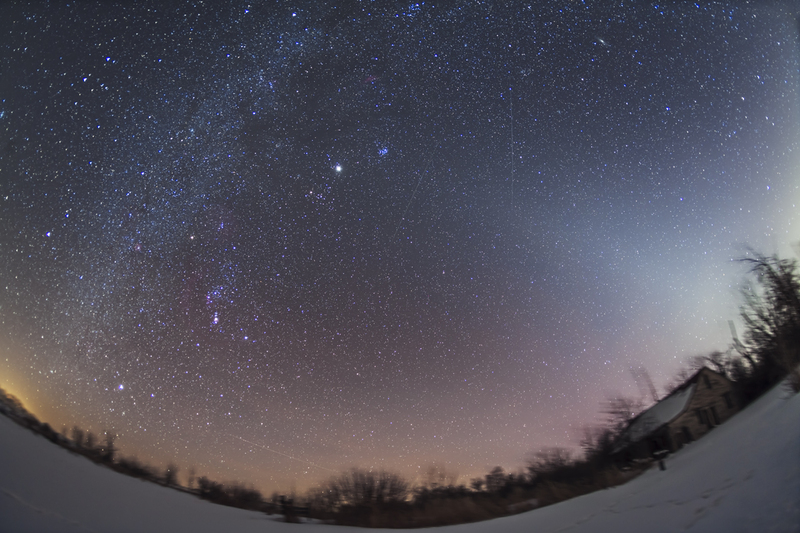 The Zodiacal Light lies along the ecliptic because it is part of our solar system, not in our atmosphere. It is sunlight reflected off dust orbiting in the inner solar system that’s been cast off over thousands of years by comets passing through. It is brightest closest to the Sun and fades out at greater angles away from the Sun. Thus its tapering appearance in my sky as the photo shows, very much as my eye saw it. It takes a good night at a dark site to see the Zodiacal Light. But take a look at the next dark of the Moon. You’ll be surprised at how easy it is to see once you know what to look for. 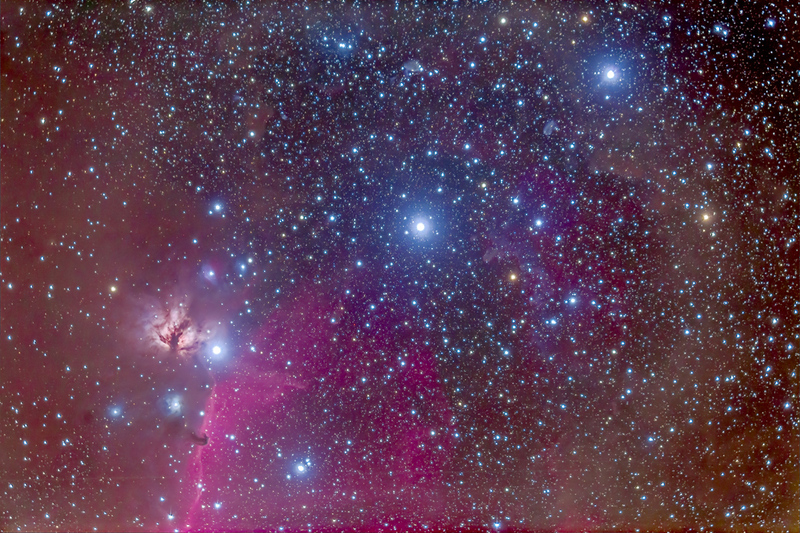 Everyone knows the Belt of Orion, but only the camera reveals the wealth of colours that surround it. I shot this Friday night, February 8, under very clear sky conditions. While I used a telescope, it had a short enough focal length, about 480mm, that the field took in all three stars in the Belt: from left to right, Alnitak, Alnilam, and Mintaka. All are hot blue stars embedded in colourful clouds. The most famous is the Horsehead Nebula, running down from Alnitak at left. Above the star is the salmon-coloured Flame Nebula. All manner of bits of blue and cyan nebulas dot the field, their colour coming from the blue starlight the dust reflects. Dimmer dust clouds more removed from nearby stars glow with browns and yellows. At left, a large swath of sky is obscured by gas and dust simmering in dull red. The entire field is peppered with young blue stars. It is certainly one of the most vibrant regions of sky, though only long exposures and image processing bring out the colours. This is another test shot with a new Canon 6D that has had its sensor filter modified to transmit more of the deep red light of these types of nebulas. The camera works very well indeed!